The DG834G has a firmware bug whereby the statistics reported are an overall average not realtime, this results in the stats reported by DGMon also being an overall average. You can see this bug in action if you go to the web administration tool, select router stats, then click show statistics. Notice they are wrong. Lets hope Netgear fix it in the next firmware release. Router password is stored in plain text in the ini file - use file security settings to fix this for now. Sometimes activity bars stay greyed out when they shouldnt be - restart fixes this problem. 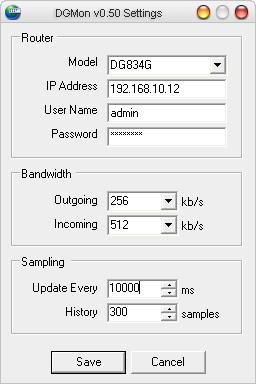 Added support for DG834G router. Graph now behaves properly when current stats are not available. Changed ini file location to Windows directory. Changed default history length to 300.